A time of family gatherings and lavish meals called Seders, the story of Passover is retold through the reading of the Haggadah. With its special foods, songs, and customs, the Seder is the focal point of the Passover celebration. Passover begins on the 15th day of the Jewish month of Nissan. As the Jewish day begins at sundown the night before, for the year 2007, the first night of Passover will be April 02nd. Determine how many guests are coming and be sure to check whether they have any special dietary requirements. Arrange to borrow or rent tables, chairs, wine glasses, dishware, etc., if necessary. Check out the grocery store for new menu items and test out the ones that interest you. Decide on your final menu. Gather all your recipes and make a shopping list of items you’ll need (consider dividing items by perishable and nonperishable if you want to split up shopping trips––and don’t forget to account for any items guests are bringing). Start any special projects (such as making a Matzo bag or pillow rests with the children). Start shopping for non-perishable staples, such as matzo, horseradish, wine and grape juice. Place any necessary orders with the butcher. Polish silverware and iron table linen. Think about seating arrangements and create place cards if you wish to have a more formal Seder. Shop for perishable items, such as meat and vegetables (don’t forget flowers for the centerpiece, if necessary). To save money on bagged ice, start making your own cubes and placing them in a freezer bag early in the week. Prepare as many dishes ahead of time as possible, including baked items. Gather serving bowls at least a day in advance (consider labeling each with a post-it note indicating its purpose and be sure to match up a serving utensil for each). Fill your salt and pepper shakers. Assemble all the settings you’ll need and set the table as far in advance as possible. A dish of salt water for dipping the Karpas vegetable. Three whole Matzos set before the leader of the Seder and contained typically within a Matzo bag with 3 compartments (for a great craft project, buy a plain Matzo bag and decorate it with sequins, beads, lace––whatever! All it takes is imagination and a glue gun). A napkin, doily, or other piece of cloth to help hide the middle piece of Matzo (called the “Afikomen”) from the children. A wine glass ("Kiddush cup") for each guest, or, if you wish, 4 glasses for each guest­­––one for each traditional glass of wine (for a little whimsy, dress each one up with a wine charm to help guests distinguish the glasses). A special wine glass set in the center of the table for the symbolic wine for Elijah. A pitcher and bowl for washing hands. A “Haggadah,” a book that tells the story of Passover, for each guest. For extra credit (although not necessary): An arrangement of spring flowers on each side of the Seder plate in the center of the table (use one type of flower only to streamline the arrangement and keep the Seder plate the focal point). Also nice but not necessary: A handwritten or home-printed menu of the night’s fare on each guest’s plate. To double it as a place card, personalize the menu with the guest’s name on top. When shopping at the grocery store, ask them whether they know the meaning of symbolic items, such as matzo or horseradish. If they don’t know the answer, keep them in suspense by telling them they’ll find out at Seder. Assign them easy recipes, such as Nut Cookies. Put them in charge of the recipe's shopping list too when you go to the store together. 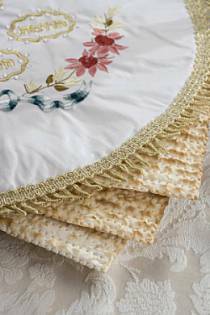 Create Passover crafts together such as a Matzo bag or Seder seat cushions. Sit them down with tasks that take concentration, like polishing the silverware if they’re old enough, or folding napkins. Keep the wrapped “Afikomen” gift (the gift for finding the hidden Matzo) in plain view during the days leading up to Seder to create anticipation. If all else fails, put a good Passover storybook or coloring book in their hands. (For instant options, do a search on the Web for “Passover stories.”) Not only will it occupy them, it will help them understand why Mommy and Daddy need their help to get ready for a night different from all others. 1. Cover it with melted chocolate. 2. Make it into Pancakes. 3. Knead it into Eggless Kneidlach. 4. Schmear it with your favorite schmear. 5. Roll into a basic ball. 6. Crush it into "bread crumbs". 7. Shape it into a Farfel Ring. 8. Bake it into Apple Matzo Kugel. 10. Or, just plain stuff it. Substitute: 1 tablespoon lemon juice plus enough milk to make 1 cup. Let stand for 5 minutes. Substitute: If comparable Passover ingredient is not available, substitute apple, orange, wine, or grape juice in the same amount, or bouillon in the same amount, depending on the nature of the recipe.